The last paragraph of the prologue to “The Book of Roger” sets down specifically that there will be 70 tableaux or maps accompanying the text. 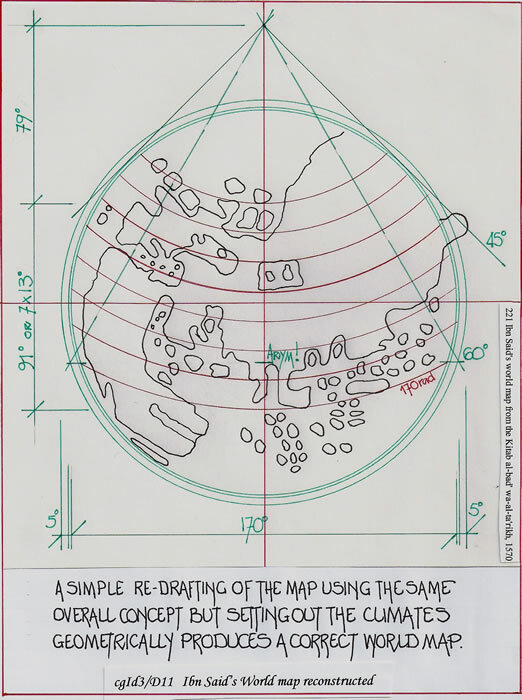 It does not mention that a “World Map”, circular or otherwise should accompany the text even though it is actually a necessity to illustrate the overall schema. Without an overall map as part of “The Book of Roger” it is doubtful that the individual tableaux or maps could be located and the climate limits set. But this is not the map to compare the tableaux to.That is discussed in text cgId4; this map is a small stand alone preparation. Thus we must analyse the circular world maps to be found within the extant copies of “The Book of Roger”, to determine if they are contiguous with the 70 tableaux and are thus in fact the equivalent of a book of instruction for those tableaux. The text alone does not provide sufficient detail to draw them. 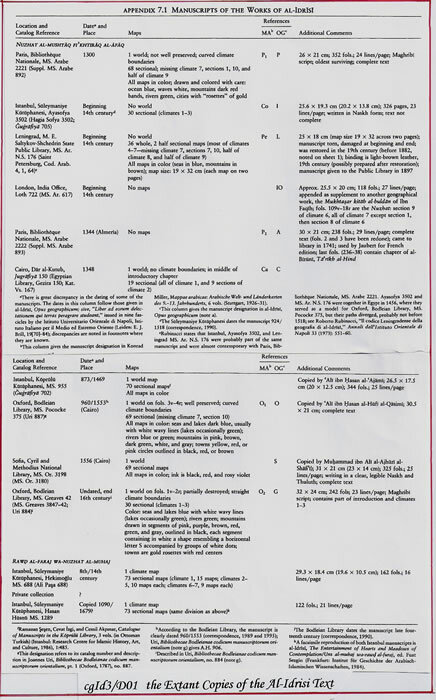 The first diagram is in fact a list of the extant copies of the Text of Al-Idrisi which will enable researchers to note the various master copies and their age. It indicates I use the oldest text here-in. The following is an abstract from the prologue taken from the French translation by Jaubert and is this author’s translation. But I caution all as Arabic to French to English will be fraught with difficulty. “The 7 Climates are traversed by 7 Seas of which we speak following, if it pleases God. The 7 Seas are called also Gulfs. Six are contiguous; one only is separated without communication with the others. The last paragraph of the prologue is the determinant; it sets down the ideas Al-Idrisi wishes to fulfil in that he desires to use the system detailed by Claudius Ptolemy in both Climate division and oikoumene length. Claudius Ptolemy is very specific in determining the limits of the Climates and the world measures. “The number of tableaux following is therefore raised to 70 without counting the two extremities, of which the one forms the limit of the habitable places at the south side, the major part of which has extreme heat and aridity rendering entirely deserts, and the other the limit of habitable places at the north side, where the excessive cold produces the same effect. At the middle of this method the reader sees in the tableaux the true situation and the exact form of the countries; but if he stops to consider the state of these countries, their structure or arrangement of parts, their habits, the clothes of the inhabitants, and the open routes, in this way the distances in miles and parasanges, and the curiosities which exist and are to be attested by travellers, sailors and the historians will be understood. It is perhaps pertinent to commence such a project where the original author omits to mention a crucial map, a circular map with climate lines within his text, although one is appended to each copy, with an investigation of those circular maps as they appear in the texts. That however is problematic as they are no doubt the product of later copy scribes and may not be as exact a copy of the “original” as we would wish. We should be cognisant of the fact that the oldest text, dating from c1300AD, is only 150 years after the original was written in 1154AD, and that is the ARABE 2221 TEXT which is held by the BnF in Paris. That is it is probably as close to the original as we are likely to get, but unfortunately with age comes degradation and the world map there-in is in a poor condition. However it must be the first utilised. The circular map within that text is unfortunately distorted as the attached copy indicates. There appears to be a geometric basis but part has been compromised and the Red Sea appears to have disappeared. But, since c1300AD this map may have been mistreated and even amended as has the Climate 4, Section 1 tableau discussed fully in text cgId2. But if we study the ARABE 2221 circular map, there-on are visible the curved lines of the Climate boundaries; these can be evaluated to ascertain the probable geometry of the whole map. If the basic circle of the world is taken as 180 degrees, which accords with Al-Idrisi’s comment regarding the whole world as 360 degrees, and as any normal view can only be 180 degrees on a plain diagram, we have a starting point and scale to utilise. Thus the outer circle has a diameter of 180 units or degrees and the oikoumene which is within that circle can be measured and shown to be 162 units or degrees. 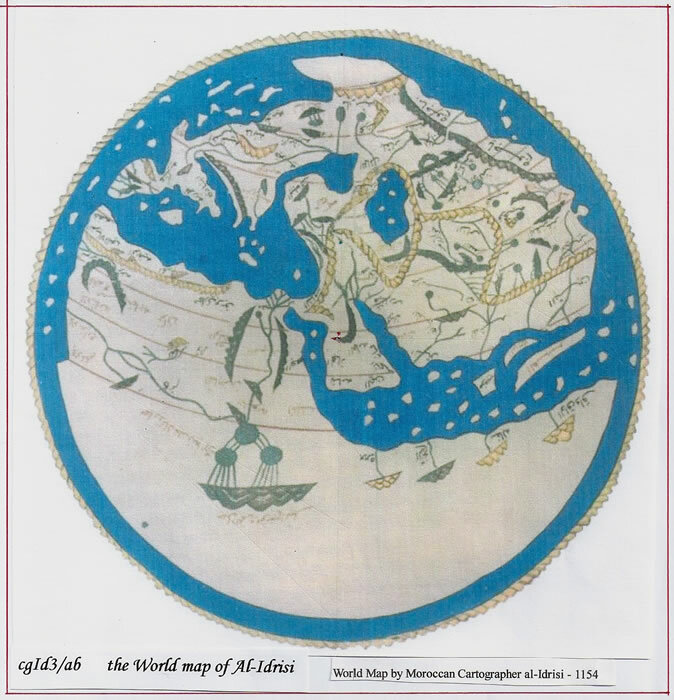 The oikoumene must be less than the 180 degrees or it will actually fill the whole maps diameter and not accord with the text of Al-Idrisi where he states, “The Ocean Sea surrounds a half of the globe without interruption in a circular zone.” This is precisely the view given by the ARABE 2221 circular world map and all other copies; an oikoumene surrounded by a circular ocean. But, it is also possible that Al-Idrisi carefully read the text of Claudius Ptolemy, Book 1, Chapter 10 where-in he states that “the longitude or distance eastward should be seen to include ‘not quite the space of 12 hours’, that is, by locating the Fortunate Islands at the extreme west and placing at the extreme east the Seres, Sina and Cattigara.” Thus the 180 degrees is reduced to 162 degrees with alacrity. Thus the full description of the circular map base construction is hidden within the Al-Idrisi text. As stated the world circle can only be 180 degrees and thus this measurement can be used to produce proportionate measures for the maps construction. But, given that there is distortion and damage to the ARABE 2221 map and an outer section may have been amended I have chosen to compare it to the POCOCKE 375 map which is by comparison perfect and capable of a complete geometric analysis. The two maps are dealt with separately, thus the intent and continuity of design can be illustrated. The basic map and extent of the climate lines are illustrated by diagram cgId3D03. From these outer circles, oikoumene circle and climate arcs it is possible to geometrically assess the original centre point and external centre point of the climate arcs. As stated, the main map circle is considered to be equivalent to 180 degrees diameter and thus the oikoumene circle can be assessed as 162 degrees as diagram cgId3D04 illustrates. The largest climate circle which can be assessed was then used to locate the external centre point from which the original climate lines can be redrawn. The radius of those climate lines was found to vary from 42 to 140 degrees and thus the spread for the 7 climates is 98 degrees. That is of course a simple spacing of 14 degrees per climate as 7 x 14 = 98. The geometry of the map is quite precise as we would expect from a peoples whose geometric forms are marvelled at even today. The one surprising feature of the map however is its centre point position. Unfortunately the loss of the Red Sea inhibits a definitive statement as to the precise location, but it is resolved later with the use of the near perfect later circular maps such as diagram cgId3D05. It should also be noted that in the prologue Al-Idrisi states that with the land mass in the east, the China Sea is 13.5 degrees north and the complete reconstruction of the first climate line, i.e. the second actual line as the first is the Equator, set at 14 degrees north precisely matches the text of Al-Idrisi. That of course is a pointer to the lines being drawn first, the geometry is first and the maps geography appended afterwards. Thus the map is a pure geometric construct. The preservation of this map and others within this version of the text of Al-Idrisi, held at the Bodleian library, Oxford is superb. It is a copy of the Cairo manuscript dated 1456 and thus some 150 years younger than the ARABE 2221 BnF text dated to c1300AD. The original text is dated 1154AD. The map has an outer frame circle, oikoumene circle and enough of the 8 climate lines to enable a very thorough geometrical assessment of its design and construction as diagram cgId3D06 illustrates. The world circle is taken as 180 degrees measurement and thus the oikoumene can be shown to be drawn at 162 degrees diameter. The climate lines were then assessed and the largest, the equatorial circle has a radius equal to the oikoumene diameter, that is 162 degrees radius. It is also accorded a significant setting out point, that of 1/6th of the oikoumene circle, i.e. 162/6 = 27 degrees below the world circle centre point. It was then found by the analysis undertaken that each Climate line was yet again at 14 degrees from the next and the overall spread 98 degrees. This determined that the smallest Climate circle has a radius of 64 degrees. This is very significant as the northern limit of the oikoumene is set by Al-Idrisi at 64N and thus the climate line reflects this position precisely. It also indicates that the 162 degree oikoumene circle and equatorial climate line radius are of a geometric construct determined by 64 + (7 x 14) = 162. But there is also one very strange coincidence. The Ocean has a 9 degree circular space and the actual spacing of the Climate lines, geographically, if equally spaced would be c9 degrees, i.e. 7 x 9 =63 equal to the Geographia of Claudius Ptolemy where-as Al-Idrisi uses 64 degrees. Why would Al-Idrisi change this well known northern limit? The 64 degrees would therefore appear to be a geometric necessity such that the mathematics would work as diagrams cgId3D06 and cgId3D07 illustrate. That is to say, Al-Idrisi has deliberately altered the 63N of Ptolemy not for Climate or Geographical reasons but for the precision of the geometric construct. It is thus possible to opine at this juncture that a very competent geometrician or mathematician had already designed the Maps construct and it is not the work of a scribe inserting this circular world map into the “Book of Roger”. This map is so very necessary to explain the whole oikoumene and the positioning of the Climate as the 70 tableaux are a sub-division, an arbitrary sub-division, which do not represent land masses, islands or seas in a geographic format. The ARABE 2221 map is unfortunately unable to assist in determining the accurate position of the geometric construct, the chosen centre point for the circular world map. It does indicate that it is within the Arabian Peninsula, but without a Red Sea coastline the possible location is uncertain. Thus again we must turn to the POCOCKE 375 circular world map for assessment. From a newly drawn to scale copy of POCOCKE 375, that is diagram cgId3/D07, the actual centre point can be shown to be 27 degrees above the Equatorial Climate Line, i.e. the 1/6th point previously discussed as the geometric setting out divisions. But that fact hides the major setting out, the LATITUDE or base line of the Equatorial Climate and the geometry of the whole map. The 162 degrees radius of the Equatorial climate line cuts the 162 diameter oikoumene circle to produce a 60 degree equilateral triangle which was determined by the 1/6th division setting out point; i.e. 360 / 6 =60 degrees. This is plain geometric fact. However the horizontal base line of this triangle, a line also 162 degrees long crosses the centre Longitude line precisely 21.5 degrees above the Equatorial climate line. The Muslim Holy City of Mecca is geographically 21.5 degrees latitude, with a longitude of 390 54’E. The closest town that Claudius Ptolemy is aware of is BADEO REGIA at 700N; 200 15’N. Therefore it is quite plain that Al-Idrisi wanted Mecca to be the longitudinal setting out point and accordingly drew the Mediterranean Sea and Red Sea to occupy 90 degrees of the oikoumene and thus distort the eastern portion of that oikoumene as Mecca is actually geographically c49 degrees from the Sacred Promontory, the edge of the oikoumene in the west and Ptolemy states 70 degrees to Mecca. Thus the religious necessity of Mecca as the centre of the world on this Arab map is equated with the religious necessity of Jerusalem at the centre of Christian maps. 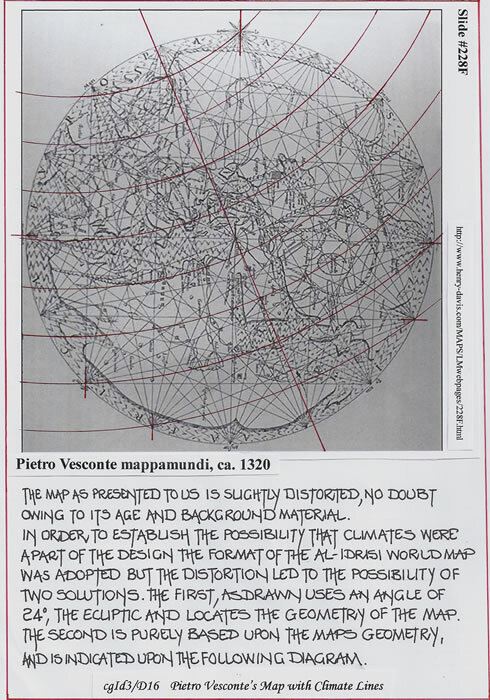 Within the text of “Geographia”, Claudius Ptolemy sets down two methods for portraying the world globe containing just the oikoumene on a plain two dimensional sheet of paper. The first method is fully described in my text reference Cp4 and there-in illustrates that his written description has unnecessary and even wrong instructions given for the primary setting out. However, the basic construct of latitudinal or the climate lines is sound, and a glance at the resultant diagram will indicate the primary similarity to the circular world map within the text of Al-Idrisi. 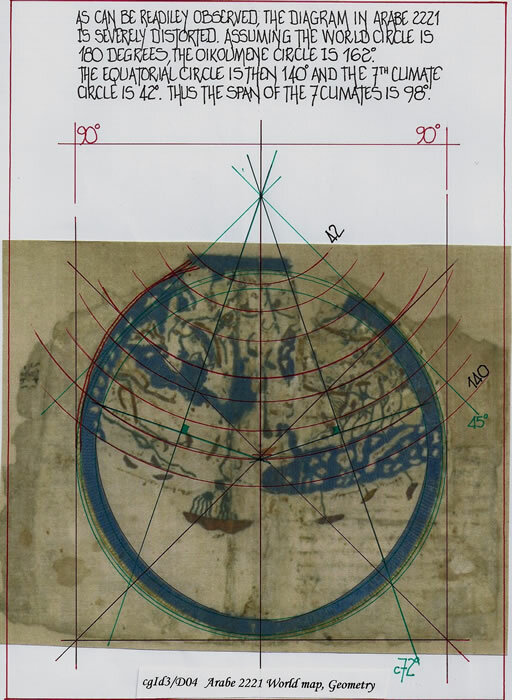 The second methodology promulgated by Claudius Ptolemy is an enhancement of the geometry to change the radial longitudinal lines to arcs and thus be a more realistic visual representation of the lines of longitude upon a globe. 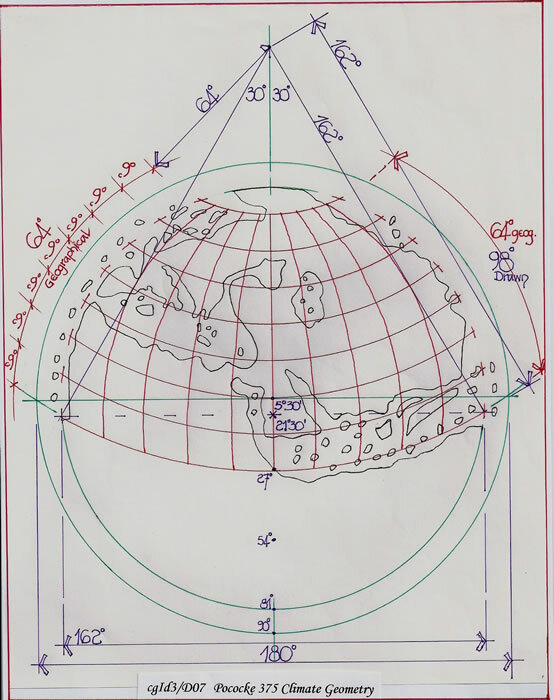 Thus, as diagram cgId3D07 illustrated, the tableaux division lines of Al-Idrisi when drawn on the circular world map represent the longitudinal lines of the second method of Claudius Ptolemy. We may therefore infer that this is the basis of the geometry of these world maps. It is perhaps somewhat superficial to research just copies of one text, The Book of Roger, to determine the Arab Geographers view of the world and oikoumene. 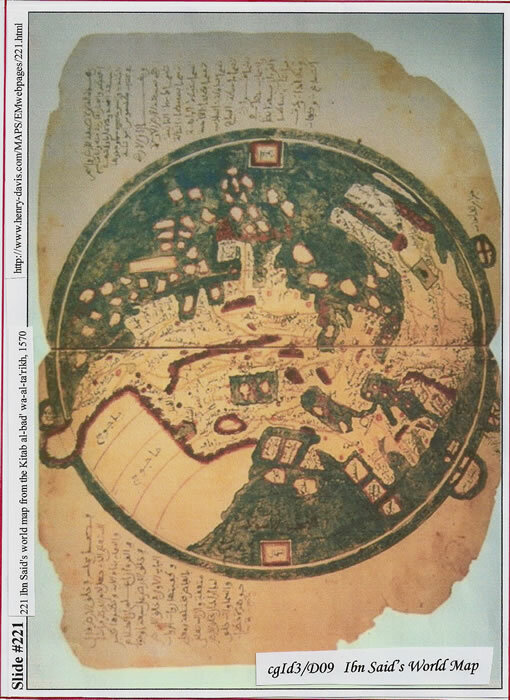 Other well known Arab Geographers have written their own treatises and produced world maps. Unfortunately the majority tend to be diagrammatic representations of the world and have no scale or real geographical content with which to analyse the actual world. Thus the few “geographical” maps available to us from Arab sources must be relied upon to portray a more appropriate configuration, or should we say geographic configuration of the world. and look at the list of available maps dating from 400AD and read the text accompanying. 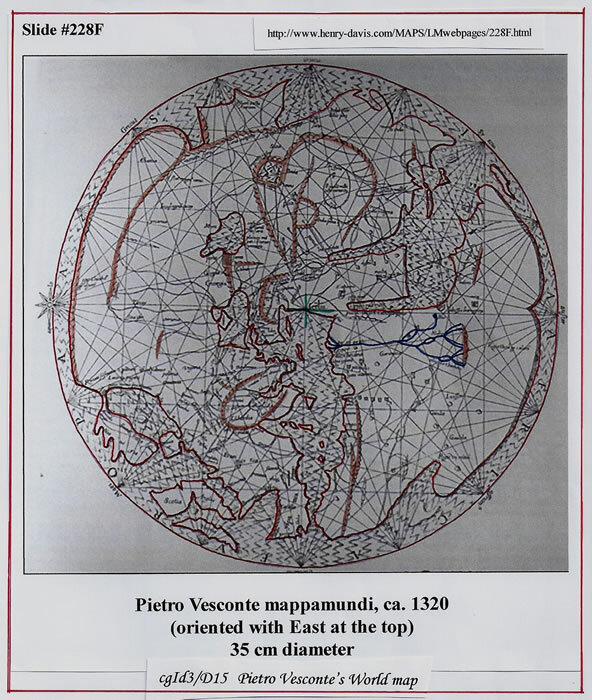 It is also very necessary for the appropriate chapters within the History of Cartography to be read, and these can now be found on line at; http://www.press.uchicago.edu/books/HOC as PDF downloads. 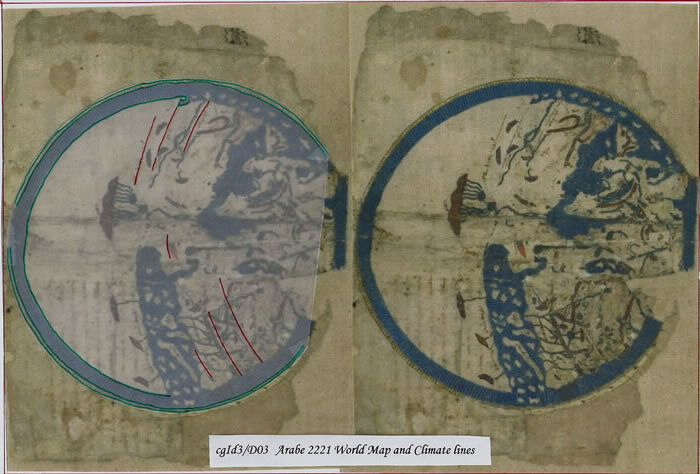 Over 100 years after the POCOCKE 375 manuscript of the text by Al-Idrisi was copied from the Cairo document in 1456AD, a world map, circular, was drawn to accompany the “Kitab al-bad’ wa-al-ta’rikh”, the World Geography of Ibn Said, dated to 1570AD. On viewing we see can infer an amalgam of Ptolemaic and Arabic geometry within the map, let alone the advance in the actual geographical content portrayed for not only the oikoumene but now a wider world. The maps geometry with the outer circle taken as 180 degrees produces an oikoumene circle of 168 degrees, but there the similarity to previous examples ends. There are in fact two centre points used for the climate lines even though they appear to be visually equally spaced upon the centre longitudinal line. The northern climate line is 52 degrees which represents the Ptolemaic radius on his first projection and from there they appear at first to be set at 11 degree centres and then at 9 degree centres. However, the second centre point is set 64 degrees above the horizontal centre line and is also the nominal setting out for Centre A, the 52 degree radius as Diagram cgId3D10 illustrates. However, it also clearly indicates that the northern climate line is at 71 degrees above the equatorial climate line. This is probably a slight mis-measure on the 1570 map as it would surely be a simple average of 7 x 10 degrees or 70 degrees total. The equatorial arc is set approximately 35 or 36 degrees below the actual centre and as such would produce a different northern climate line if the same centre had been utilised. But the northern climate line is definitely indicated by the land profile on the map as spreading from geographical latitudes of 500N to 630 or 640N. The profile of northern Europe is twisted to align the southern area of Britannia to the Baltic Sea which is geographically some 10 degrees further north. Thus we can but generalise on the intent of Ibn Said and his circular world map with its somewhat spurious climate lines. It is as though his map has been drawn on the paper with the outer circle frame and then the climate lines have been appended and have been distorted to become at least partially visually correct. 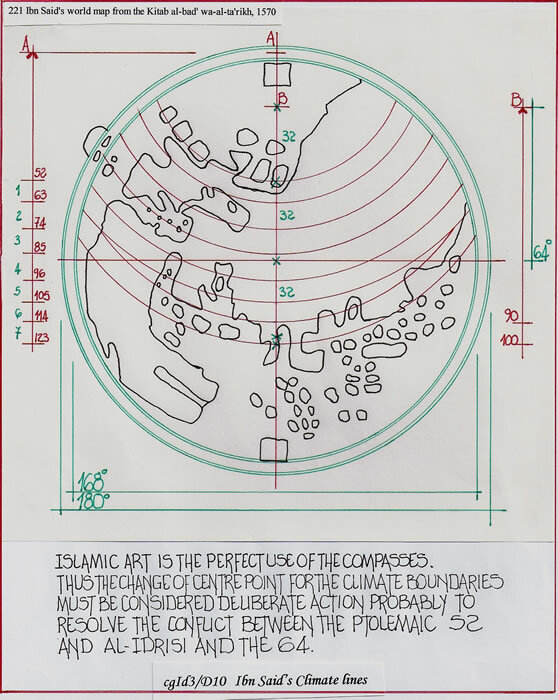 The map, which is far in advance of that by Al-Idrisi, has simply been drawn with climate lines utilising the wrong centre point for their radius. 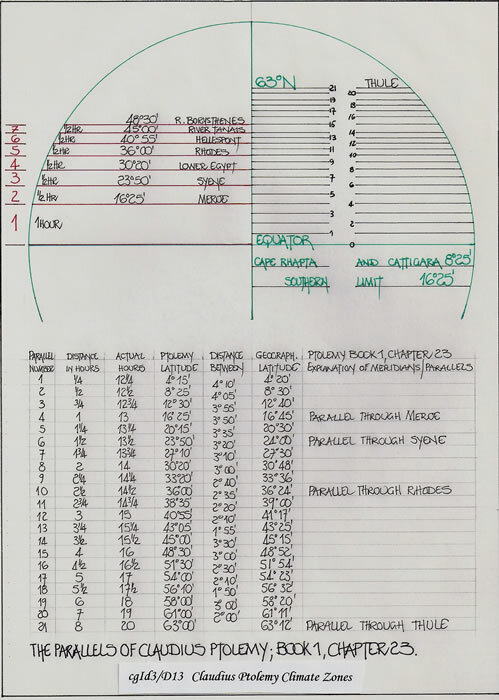 This can be illustrated by a simple redrafting of the map, moving the centre northwards to place the true equator and the climate equatorial lines in their proper relationship as diagram cgId3D11 illustrates. Thus the geometry is corrected, but it indicates the map may have been far more important as just a geographical portrayal of the oikoumene. If it was drawn as a geographical concept only then the climate lines appended they could only be drawn on a best fit possible basis. The zonal diagram is just that, a world circle of 180 degrees with 8 lines encompassing the 7 climates. A transliteration was carried out in the 1870’s which indicates that YAQUT considered the climates to be of the traditional Greek concept of half hour bands across the oikoumene determined by the length of the longest days. They vary from 13 to 16 hours precisely as the zones promulgated by Claudius Ptolemy. His ranged from Anti-Meroe below the Equator, having a longest day of 13 hours, to the Equatorial line having a longest day naturally of 12 hours, and thence to Meroe itself with a longest day again of 13 hours, being at 16 25N, and thence to Thule at 63N with a longest day of 20 hours. The design of YAQUT is spread from 13 to 16 hours corresponding to the climate zones of Claudius Ptolemy for Meroe at 16 25N and the 13 hours to the 16 hour climate line which is the mouth of the River Borysthenes at 48 30N. This is an actual geographical spread of 32 05 degrees. 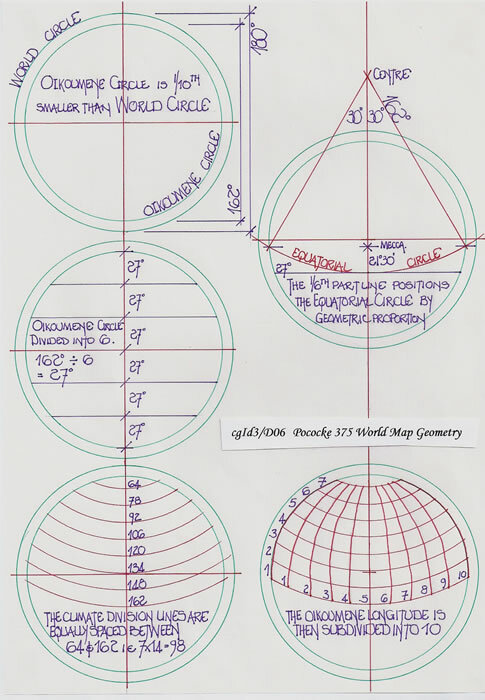 The construction of the YAQUT diagram as indicated on cgId3D12 is based upon the natural 180 degree world circle, with the 1/6th sub-division to delineate the geometric construction. It would be somewhat fanciful to assume that in fact the distances could have been 64 degrees and not the 60 and 66 degrees indicated with the centre core of 52 degrees and not the simplistic 54 degrees or 9 x 6 illustrated. But the 1/6th is so geometrically correct as to preclude such fancifulness. The problem is, the original is only c120mm diameter and as such perhaps introduces an inaccuracy which we cannot enumerate. But the diagram illustrates the use of 162 degrees as the Equatorial radius precisely as the maps already investigated. Therefore, it could be argued that it represented in fact a spread of 106 to 162 degrees, thus being a 56 degree spread and 7 climates of 8 degrees each. The climates of Claudius Ptolemy can be illustrated commencing at 13 to 13.5 hours or 160 25’ to 230 50’, a spread of 70 25’ degrees, and thus the 8 degrees may be seen as an acceptable division given that the Equator at 0 degrees and Meroe at 160 25’ degrees is a one hour division and near an 8 degree average. But, YAQUT has his climes spread slightly differently if his text is taken literally, with the spread as follows; the 13 hours is stated as the middle of the first clime and thus we can tabulate the series as follows with YAQUT’S hours as a median. 13 hours is 12h 45m to 13h 15m; 13h 30m is 13h 15m to 13h 45m; 14h is 13h 45m to 14h 15m; 14h 30m is 14h 15m to 14h 45m; 15h is 14h 45m to 15h 15m; 15h 30m is 15h 15m to 15h 45m and finally 16 hours is 15h 45m to 16h 15m hours for the 7th climate. These correspond to the Meroe and Borysthenes of Claudius Ptolemy as already noted but, in fact will give a greater latitudinal spread than the climates of Ptolemy. That is, Ptolemy has Meroe at 160 25’N, with a longest day of 13 hours and the Borysthenes is 480 30’N with a longest day of 16 hours. But YAQUT appears to have climates from 12H 45M to 16H 15M which is a latitudinal spread of 120 30’ to 500 00’ and therefore a total spread of 370 30’. This is a sub-division of 50 30’ per climate average, where-as Ptolemy has a spread of 320 05’or 40 35’ per climate. 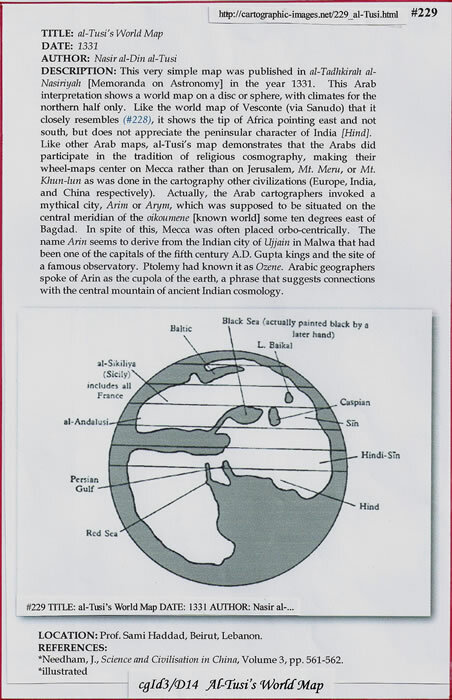 Therefore, perhaps we should consider that the YAQUT diagram wording “Middle Of” does not refer to the middle of the clime being the hour stated, but perhaps is a continuation of the other text, “The Islands of the Sudan in the east, Middle of”. That does not read correctly, but it may actually mean that the Islands of the Sudan in the east are in the centre of the clime. There is little sense in YAQUT stating climates and delineating their centre. 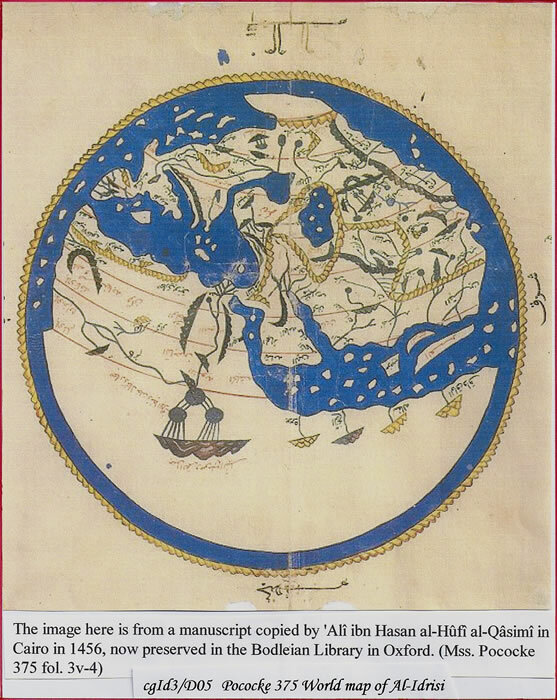 This map with its accompanying text already appended is included as the text discusses both the mythical Arin or Arym, the supposed place which delineates the central meridian, as well as the fact that Arab Geographers placed Mecca orbo-centrically. The text also leads into a discussion of Western circular world maps. It is unusual in western cartography, other than for a religious base map, to find a circular world map with what may be described as rhumb lines, sailing directions appended. Pietro Vesconte’s other maps are chiefly sea-charts and thus this circular map has a continuation of the typical look of a sea-chart. Thus we see a realistic portrayal of the North Sea coast, the Mediterranean coast, the Black Sea and the two gulfs. But the most striking feature is the use of the 16 cardinal points of the compass and their use to insert the “rhumb line” squares on to the world circle. However, the map does not have the Climate lines from which a direct comparison with the preceding Arabic circular maps can be made. But it is a simple geometric exercise to insert the climate lines upon the map. Simple that is if the copy map available was perfectly preserved and not distorted. There are two possibilities as diagrams cgId3D16 and cgId3D17 illustrate. 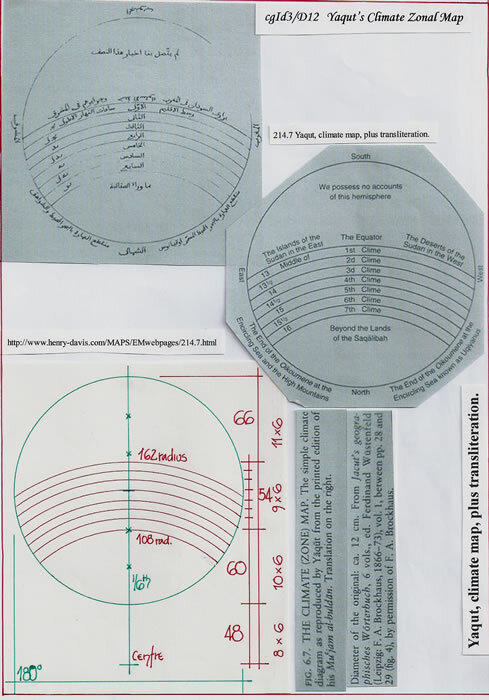 Using the copy of the map available, as presented on line, it does not portray a perfect circle, it is either 162 degrees or 163 degrees diameter NSEW with 164 degrees diameter NE/SW. Therefore as diagram cgId3D16 indicates the positioning of the climate lines is very slightly askew from a NNW/SSE alignment. In fact, instead of the 22.5 degrees alignment, the centre line is set at 24 degrees which of course is the notional ecliptic angle. But, with such distortion it is unlikely. However, there is a significant match to the main compass points and thus the solution. 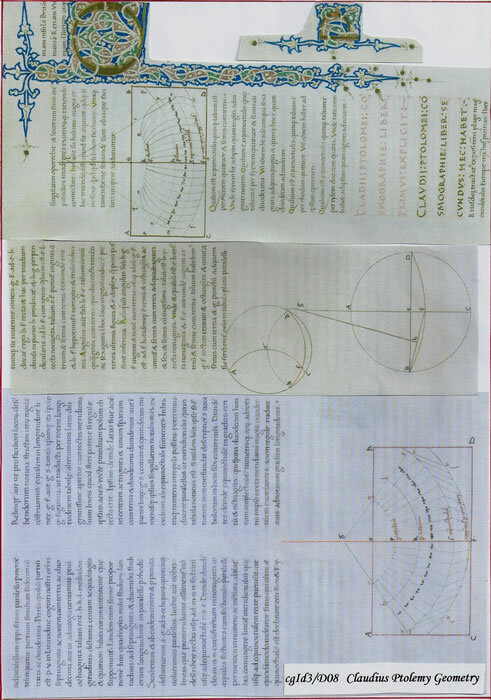 Therefore an accurate circle and compass point was drawn, 162 degrees in diameter as diagram cgId3D17 illustrates and the map of Pietro Vesconte inserted into the true circle. The obvious centre line for the climate centre NNW/SSE was extended as well as the N to E and NW/SW lines. Thus there were meeting at one point a 0, 22.5 and 45 degree line as the centre point. The climates were therefore easy to determine, being firstly two arcs, one 63N extending from N to NW and the second the equatorial line extending from ESE to SSW. The six lines forming the 7 climates were then inserted at equal centres and as with the previous diagram cgId3D16, it appeared that the major compass points and alignments were the setting out foci for the actual climates. Pietro Vesconte is the inner circle or oikoumene circle as used by Al-Idrisi on the circular world map in his text. Claudius Ptolemy was very specific regarding the Climates, their time span of generally 30 minutes and therefore their latitudinal degrees. Diagram cgId3D13 amply illustrates those facts. Al-Idrisi states that he is using the “Geographia” of Claudius Ptolemy for his figure of the earth, and then describes how the habitable part of the earth was divided by the experts into 7 climates, with each stretching from west to east. He acknowledges that they were not natural lines, but ideal or imaginary lines determined by Astronomers. However, the habitable part of the earth, the southern limit of the habitable world is given by Ptolemy as the same distance south of the Equator as Meroe is north of the Equator. Thus in fact we may surmise that it stretched from 160 25’South to 630 North, and would have 2 half hour climates below the Equator, and 12 half hour climates plus 2 one hour climates north of the Equator. Thus 7 half hour climates north of the Equator would produce the latitude of only 450N. Al-Idrisi uses the northern latitude of the oikoumene, which he states as 640N and simply divides it into 7 equal parts. That however may not have been his primary northern latitude. The circular map contained in the text of Al-Idrisi is as been shown and explained a simple geometric construct for which the Arabic world is famous. The 64 degrees is a necessity to ensure the mathematics of the circular world map are simple, containing no fractions and easily drawn with compasses. A glance at the map, diagram cgId3D05 will show the differing northern coastline to that drawn on the 7th climate, Sections 5 to 9, as diagram cgId3D18 indicates, where there is a complete mountain range which could conveniently be considered the spurious single degree from 630 to 640N. The same map indicates a zone below the Equatorial climate line as does the circular map. Thus the climate boundaries of Al-Idrisi which are equally spaced may be taken as 9 degrees of latitude and the 10 sections of each climate, which correspond to the length of the oikoumene of 180 degrees taken as representing 18 degrees each even though for drafting ease the oikoumene has been foreshortened to 162 degrees. Thus as there are 70 tableaux which are rectilinear, the latitude and longitude measure are one and the same and hence each tableau should be 9 degrees by 18 degrees or have a ratio of 1:2, height to length. Thus the geometry of the circular world map, as diagram cgId3D07 indicates is a pure geometric construct enlarging the western half to a centre line at Mecca and fore shortening the eastern half from Mecca to the land of Sine. It is an explanatory manual for the 70 tableaux, but why was its presence never acknowledged by Al-Idrisi? But there is one section of the text of Al-Idrisi that has not been analysed and that is his Preface. There-in is a description of the formation of a drawing board onto which a world map is to be drawn and then that drawing is to be used to carefully copy engrave it on a circular silver sheet which is the actual map which was to be displayed in Palermo at the court of King Roger II. Thus it is easy to surmise that the small paper copy included in the ‘Book Of Roger’ is just that, a diagram of the main map for reference purposes. 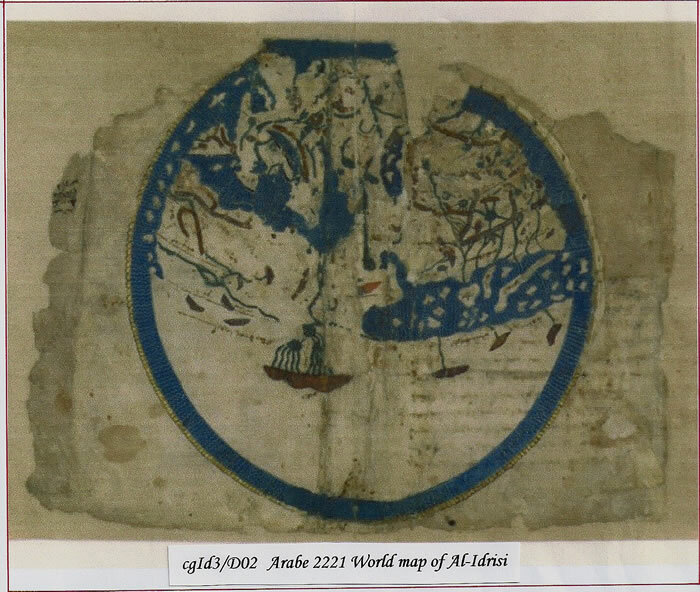 The following text cgId4 fully explores the preface and prologue texts of Al-Idrisi, and also explains the metrological basis for the circular map.